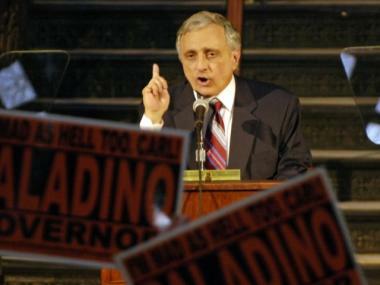 Carl Paladino, who will debate his rivals to become governor on Monday. MANHATTAN — A televised debate between New York's gubernatorial candidates is expected to be a slug fest - quite literally. When fiery Republican Carl Paladino, Democrat Andrew Cuomo and five other contenders take the stage Monday, bouncers will be waiting in the wings in case their discourse turns nasty. "We are going with the expectation that (the debaters) will be gentlemen and ladies," producer Michelle Murphy told the New York Post. "But we don't have any control (over them), so we are prepared for anything." The race for governor has already had several ugly turns, including allegations made by Paladino that his Democratic rival has had "paramours." He later backed down, admitting he had no evidence for the claims. New York Attorney General Andrew Cuomo. Bouncers will be in the wings at Monday's gubernatorial debate to ensure candidates remain civil. But debate organizers say nobody will be stepping in to cool down tempers unless they really have to. "We've decided it has to be severe, a severe personal attack where our moderators, at their discretion, could intervene," said Murphy. "Obviously, we can't prepare or control what any of these people are going to say, but we would like to keep them to the issues." The debate is a joint production by News 12, Newsday and Hofstra University. The other participants are Kristin Davis of the Anti-Prohibition Party, Charles Barron of the Freedom Party, Jimmy McMillan of the Rent is 2 Damn High Party, Warren Redlich from the Libertarian Party and Howie Hawkins of the Green Party.